(Photo: © Peter Kenny)Monsignor Obiora Ike on June 4, 2018 near Geneva, Switzerland. 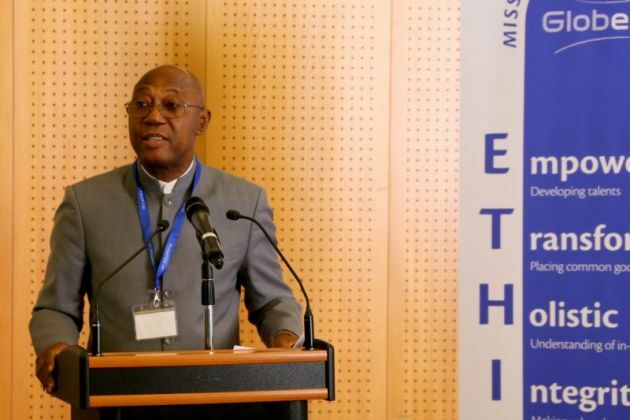 Globethics.net Executive Director Monsignor Obiora Ike, a Nigerian academic, says the world needs ethics and he includes that in higher education. He spoke at the opening on June 4 at the Globethics.net International Conference at the Château de Bossey, outside Geneva, Switzerland, where the World Council of Churches has its Ecumenical Institute. The theme of the conference at the Geneva-based ethics institution was "Managing and teaching ethics in higher education: Policies, skills and resources." Catholic priest Dr. Ike studied from 1975 to 1986 in Nigeria, Austria, Germany, France and UK, and holds degrees in philosophy, theology, economics, journalism and political science. He said in his welcome address that the organization he heads is the largest global digital provider on applied ethics. "The world is in need of guiding ideas, a vision, to more effectively direct our intellectual, moral and scientific capabilities for world peace, global security, human dignity and social justice. "Our world needs ethics, more ethics, and much more ethics. "Only in ethics, with ethics and through ethical standards can we evoke evolutionary ideas that can spur our collective progress without the wake of destructive violence that threatens to undermine the huge but fragile political, social, financial and ecological infrastructures on which we depend and strive to build a better world." He said the conference is held for scholars and practitioners to explore symptoms, their underlying causes, and the outdated theoretical concepts that unpin the present global dilemma "with a hope to give solutions through education." Ike said the conference was showcasing with all its stakeholders – teachers, institutions, students, and professionals – its resources, tools and training for capacity building. "Can any sustainable development and progress be assumed for humanity if it is devoid of education, and come to reason on this, surely an education that has strong content in values and ethics that produce leaders that are values-driven?" he asked. He asked if any sustainable development and progress be assumed for humanity if it is devoid of education, and come to reason on this, surely an education that has strong content in values and ethics that produce leaders that are values-driven? Ike said, "The founder's spirit behind Globethics.net was motivated by a deep emotional commitment and sense of responsibility to work for global leadership founded on ethical pedestals for the betterment of all. "The overriding conviction then, as it is still now, was on the need for a united global effort to promote values-driven leadership through ethics, so that we can meaningfully control the forces of science and technology and govern the peaceful evolution of human society." More than 115 teachers, policy makers, research fellows, vice-chancellors, ethics and scientific institutions, consultants, NGOs, IGOs (inter governmental organizations) and other stakeholders gathered from all over the world during three days.